Archaeologists believe the Babylonians were the first civilization to celebrate the New Year, with an 11-day holiday tied to the vernal (spring) equinox starting with a first-night festivity. Sometime during the Roman era, New Year’s was set as January 1st, a custom that was adopted in the Middle Ages by many Western countries. For millions who equate New Year’s Eve with a party, however, that date has meant coping with cold weather. That’s why beaches like Cancun, Miami Beach, and Key West are among the Top 10 most searched-for destinations during the New Year’s period. Cancun tops the list because its famous beach parties occur year round at huge clubs. More traditionally, the Mexican New Year is a wonderful opportunity to boost your fortune by eating 12 grapes at midnight: each grape carries its own wish for the year ahead. In Miami Beach, there are dozens of first night parties on land and offshore, plus the annual fireworks show at Bayfront Park at midnight, when a 35-foot neon orange descends from the facade of the Intercontinental Hotel. If that sounds like too much partying, there is a way to save money on babysitters and enjoy ringing in the New Year with the whole family: community-organized First Night festivals, a public arts project that began in Boston. What’s the big deal? Typically, these corporate sponsored, day-long festivals of music, dance, puppetry, and other arts are staged in different theaters or auditoriums, public spaces, and other venues for little or no cost. Kids activities rule the daylight, and arts events occupy the first night fun. Although many events are alcohol-free, partying and fireworks usually ring in the New Year. First Night Missoula is typcial of many towns, celebrating the turn of the year with live music, arts exhibits, and free entry to the town carousel and Currents water park from noon to midnight. A free shuttle connects the University of Montana to the downtown festivities, which also inlude ice skating, movies and dancing. Here are some other First Nights we follow annually. Be at Old School Square on New Year’s Eve 2018-19 in Delray Beach, Florida for the 25th Anniversary of the 100ft Christmas Tree! Guests enjoy ice-skating, Putt’n Around Mini Golf & Carousel, live music and much more. The event is free, but activities are a nominal fee. Be sure to make time for fireworks bursting out at 9pm, making this the Palm Beaches’ largest family-friendly New Year’s Eve program. The whole family can don a glittery T-shirt for the St. Petersburg, Florida First Night with arts at multiple venues in downtown St. Pete. Family-oriented festivities will take place on music stages, with entertainment, drama, dance, games, art, fireworks and more, so check on their Facebook page for the latest updates. Admission is by button; $12 for adults and $5 ages 6-12 (under 5 free). Get last minute Florida hotel deals for New Year’s and First Night fun. For some Floridians, the glittery “ball” being dropped may be a bird. More than 50,000 Pensacola residents are expected to usher in 2018 by counting down as a 14-foot tall, 3,000-watt illuminated pelican with a 20-foot wingspan descends during an outdoor concert. New this year is Family Fest, a party of carnival games, exhibits, music and more from 4pm till 8pm, when the countdown to lighting the pelican begins for the younger audience, prior to two shows of fireworks over the Gulf of Mexico that end at 1am. This year, the flagship First Night Day Boston will feature exhibitions and performances December 31, 2018 and January 1, 2019. On December 31st, Boston attractions include puppet shows, dance events, children’s theatre, live music, poetry slams, holiday lights and ice sculptors at work. From art gallery tours to parades, to a brand new citywide Scavenger Hunt, there’s activity from noon on until family-oriented fireworks begin at 7pm over Boston Common. At midnight there’s an even bigger Countdown to Copley fireworks illuminating the sky over Copley Square. On January 1, family and children’s entertainment will be live in Copley Square from 11am to 3pm, with everything totally free for frugal First Night fun. At midnight in San Francisco, Fireworks by the Bay are staged from barges located 1,000 feet off Pier 14 near both the Ferry Building and the SF Bay Bridge. The best land viewing is the wide sidewalk that runs on both sides of The Embarcadero; the best sea views are from one of the many cruises that ply the Bay waiting for midnight. More special New Year’s Eve events and fireworks-viewing cruises can be found here. Looking for budget San Francisco hotels for New Years? 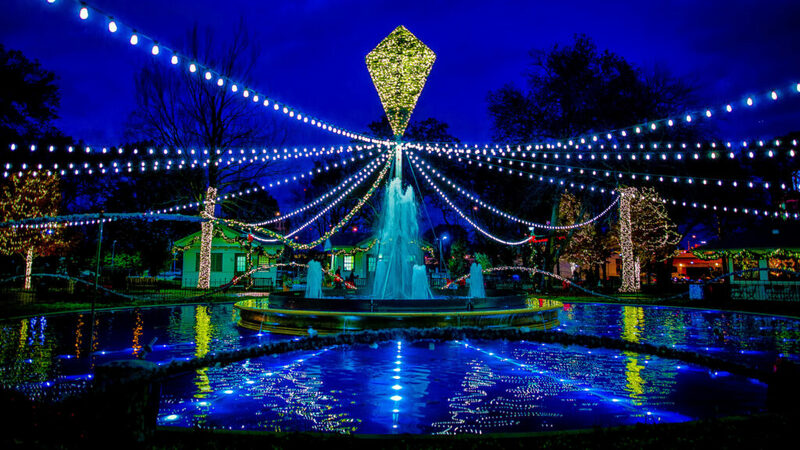 While not an official First Night event, the free Electrical Spectacle light show in Franklin Square, Philadelphia hosts special family activities on New Year’s Eve. As 75,000 lights shimmer in the chill winds off the Delaware River and holiday songs play (every half hour 4:30-8:30pm), watch the Square atop the Squarburger stand drop at 6pm to kick off the Kids Dance Party. Stick around and you can catch the midnight Sugar House New Year’s Eve Fireworks on the Waterfront, viewable from the Square. Denver is typical of many cities that have picked up the First Night vibe and made it their own. They’re putting on a family-friendly fireworks show on New Year’s Eve at 9pm, followed by the traditional midnight extravaganza, both over the 16th Street Mall. Downtown Denver‘s mile-long pedestrian promenade boasts nearly 30 outdoor cafes, many of which will be serving that night. Other family activities include the “Noon Year’s Eve” hosted by the Children’s Museum of Denver at the Butterfly Pavilion. Balls will drop every half hour between until 5pm so kids can practice their countdown and throw confetti around. At the popular Denver Zoo, a child-focused “wild” New Year’s Eve party begins at 5:30pm, with family entertainment, activities, the glittering lightshow over the Zoo’s 38 acres, and a 9pm countdown. In addition to Pensacola, other destinations have their own interpretation of Times Square’s Ball Drop which ranges from the sublime to the ridiculous. For New Yorkers, the Times Square New Year’s Eve Ball is actually a 12-foot geodesic sphere weighing 11,875 pounds. It’s covered in 2,668 Waterford crystals and powered by 32,256 LEDs which produce a stunning kaleidoscope effect. Need a discount on New York City hotels? Residents in Mobile, Alabama await the annual countdown with a tradition that began in 2008. The “MoonPie Over Mobile” is a 600-pound, illuminated MoonPie that will descend from a 34-story building to signal the start of 2018. Watch for laser lights illuminating downtown, and the official cutting of a moonpie, the favored treat of the Mardi Gras season that this town has adopted as its symbol. Chattanooga Bakery, owners of the commercial MoonPie company, bake the world’s largest edible one each year for the crowd of 60,000 who are waiting to share a bite. Children’s activities are scheduled before 8pm. Bethlehem, Pennsylvania may spell “manger” to some and the “SteelStacks” arts center to others, but at New Year’s all you hear is Peeps. The famed chick-shaped marshmallow treat is made in Bethlehem, a happy fact being celebrated on December 30 and 31 at Peepsfest. 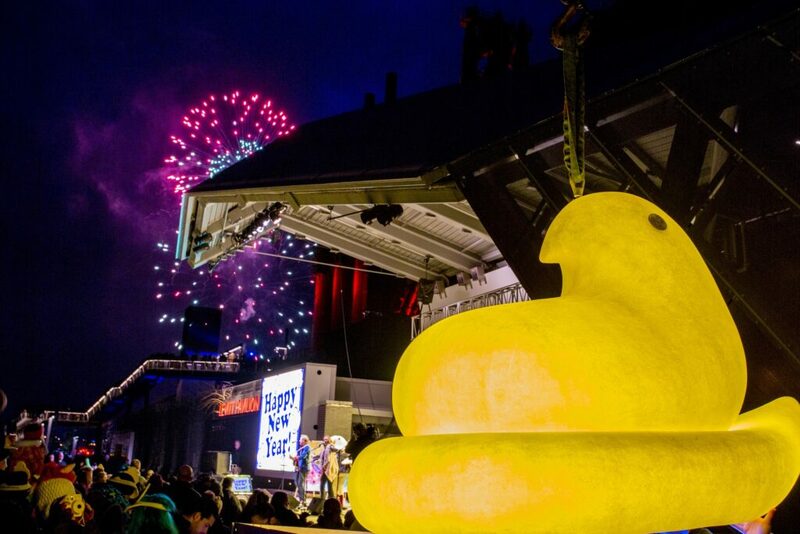 Look for live music, arts n’ crafts, and the levitation of the 4’9″-tall, 400-pound Peeps Chick Drop that will come down at 5:15pm on December 31. Last but not least is the very popular Key West celebration. Each year, the New Year’s action is split between Duvall Street, where a giant conch shell is “dropped” from the rooftop of Sloppy Joe’s Bar at midnight; and the historic seaport, where a pirate wench descends the mast of the tall ship America. (Great views of this from the Schooner Wharf Bar.) Families should start their NYE fun at the nightly sunset celebration at Mallory Square, which begins at the family-friendly hour of 3:30pm winter. If your family is on a budget, here’s where to find cheap airport transportation in New York City. For those who want to party like it’s 1999, sites like New Years.com can steer you to the nearest commercial party. Let us know what you end up doing in the Comments section below. Where are you headed for First Night and New Year’s Eve fun? Let us know by leaving a comment below!